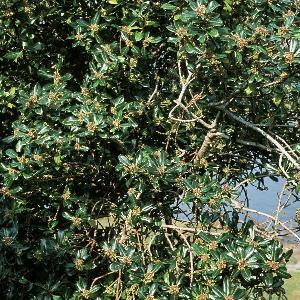 An easy to recognise shrub or small evergreen tree with thick, shiny leaves which are usually very prickly-edged, small white unisexual flowers and red berries. 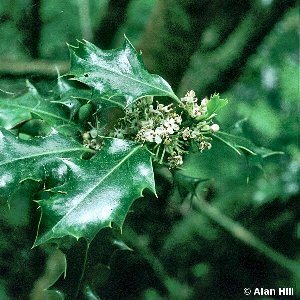 A native species of woodland where it forms an under-storey; also as isolated trees in hedgerows, river banks, rocky outcrops etc, reaching altitudes of about 1100 feet or more in areas like the Mourne Mountains. Male and female flowers are borne on separate trees. All names: Ilex aquifolium L.